My original plan was to post these for National Grilled Cheese Sandwich Day, which takes place every year on April 12th. But, lucky for me, my procrastination hasn't totally ruined one of my favorite food holidays... because, ALL of April is National Grilled Cheese Month. So if you haven't celebrated yet, get on it! In the past, I've commemorated the event with green bean casserole grilled cheese sliders, a PB&J grilled cheese with bacon jam, chicken parm grilled cheese, and even a Nutella dessert grilled cheese. If you're not normally a Hawaiian pizza fan, not to worry. Neither am I. But for some reason I'm on board with these. Perhaps because they are grilled in more ways than one. Let's talk ingredients. For bread... it was a no brainer. You just HAVE to use Hawaiian sweet rolls for this. (Right?!) My only issue was finding some without high fructose corn syrup in them... but these Pepperidge Farm ones fit the bill nicely. I still had some gouda leftover from my Gouda Bacon Mac & Cheese, so I used that as my cheesy component. For ham, I used some of this petite ham from Vermont Smoke and Cure, but you could also use some leftovers from a honey roasted ham if you have some (or if you really wanted to get into the Hawaiian spirit... SPAM!) And then I cheated and bought pre-sliced pineapple rings from the grocery store. I also made a quick honey mustard as a spread for the sliders. So I mentioned these were double grilled. Which truly makes them a grilled cheese sandwich. 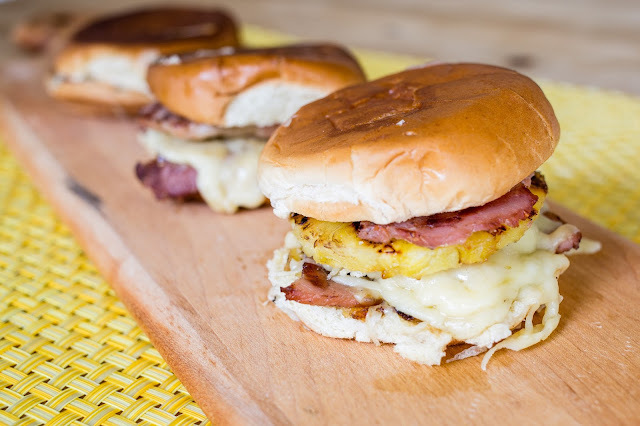 Since it's finally nice out, I quickly grilled the slices of ham and pineapple to give these sliders a nice smoky component. To assemble the sandwiches, You can grill them as you would a normal grilled cheese, or simply broil them in the oven to get the cheese to melt. It can get a little messy to grill and flip these suckers, so I might recommend going the broiler option. 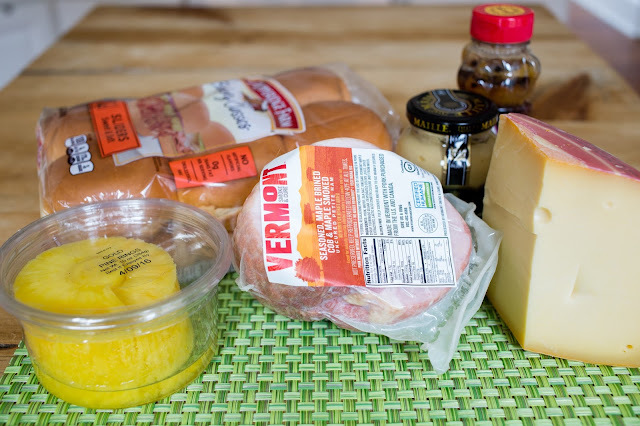 Spread each roll with a little honey mustard, then stack ham and pineapple slices and top with gouda. Run them under the broiler for a few minutes, or until cheese is melted. Top with the roll tops and broil another minute or two to lightly toast the bread. 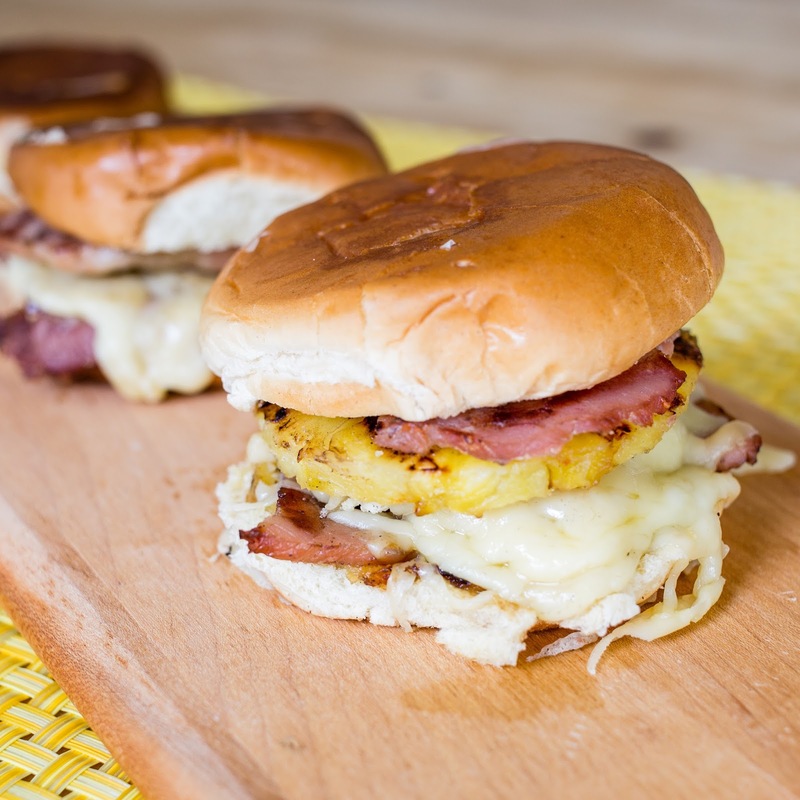 If you have extra ham and pineapple, you can stack some more on top of the cheese or just serve as-is. These would make a great addition to a summer BBQ party table. Happy Grilled Cheese Month! Preheat grill to medium and broiler to high. 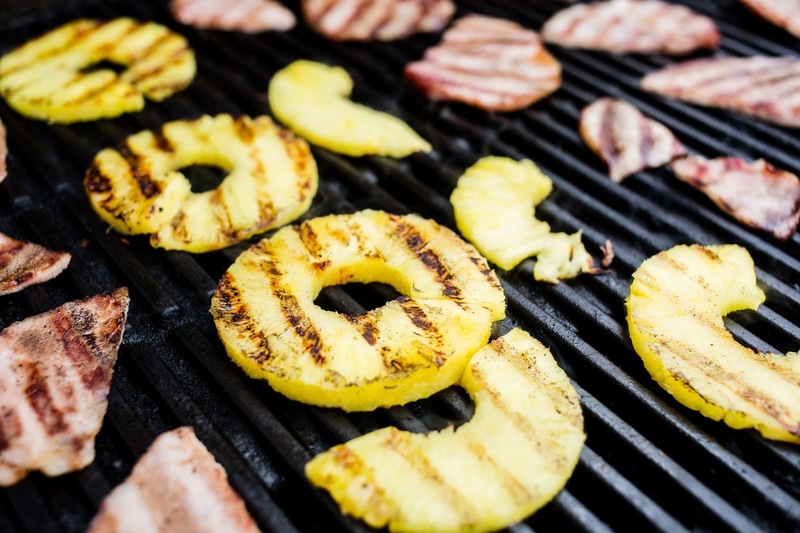 Grill ham and pineapple slices 2 minutes per side. Spread one teaspoon honey mustard on the inside of each roll. Stack pineapple and ham slices on each roll and top each with 1/4 cup of shredded Gouda cheese. 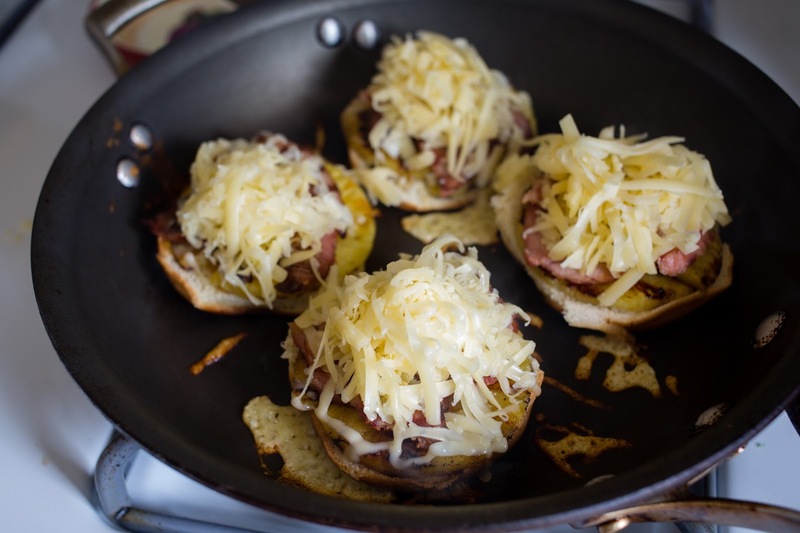 Broil sandwiches in an oven safe pan until cheese melts. Top with slider roll tops and broil another 1-2 minutes or until bread is lightly toasted. Serve immediately. This is insane goodness! I'm gonna have to try this soon. Stop. I can't control my drooling right now. These look SO good! And they're something my whole fam will love! That photo of the sliders in the pan with the shredded cheese on top just waiting to melt... my goodness yes! Seems like every day is some sort of National Blah Blah Blah Day. So Jaymee, if you could have your own National _____ Day, what would it be? And extra credit, when would it be? Oh. My. Goodness. These look amazing. I might have to make some tonight for dinner. Glad I came across your blog, Jaymee!